Happy New Year to all my Italian-food-loving friends. Do you have your lentil pot going? As many of you already know, New Year’s Day dinner in much of Italy revolves around lenticchie. Italians think their round shape makes them resemble coins. Eating them on the first of the year brings good luck and wealth, and if you really want to make a ton of money, eat them with a cotechino sausage. It’s an excellent combination, rich and opulent. 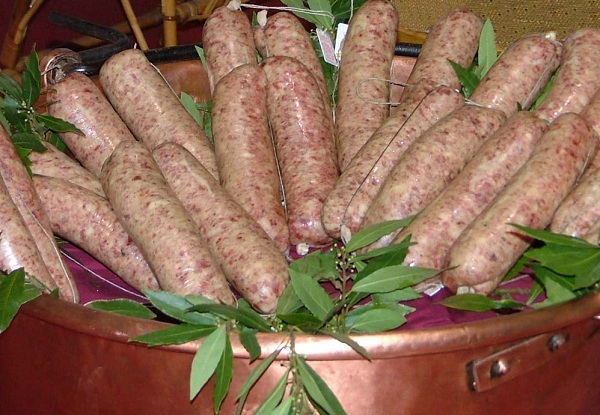 Every New Year I find cotechino, a big fat sausage originating in Modena, at several Italian markets in New York. I get mine from Buon Italia. It’s traditionally poached, sliced thick, and then laid out on a bed of herby lentils. I use Castelluccio lentils from Umbria for this. Their greenish beige color and matte finish make them look and feel like mini-polka-dot ceramics, especially when I run them, uncooked, through my fingers. And they keep their cute round shape when cooked. In a large saucepan, cover the lentils with about 3 inches of cold water, add the bay leaves, and bring to a boil. Reduce the heat, and simmer for 15 minutes. Add 1 tablespoon of the vinegar, the allspice, and a generous pinch salt, and cook for 5 minutes, until the lentils are just tender. Drain, and discard the bay leaves. In a small bowl, whisk 3 tablespoons of olive oil with the mustard and the remaining vinegar. Season with salt and pepper. In a large skillet, heat about a tablespoon of olive oil. Add the pancetta, and cook over moderately high heat 3 to 4 minutes, until lightly browned. Add the leeks and the carrot, and cook 5 minutes, until beginning to soften. Add the lentils, and sauté, stirring, about a minute. Turn off the heat. Stir in the vinaigrette, parsley, and rosemary. Add a little salt and pepper. While the lentils are cooking, prepare the cotechino. Pierce the sausage skin in a few places. Place it in a large pot, and cover with cool water by 4 inches or so. Bring to a boil over medium heat. Reduce the heat to low, cover, and simmer for 20 to 25 minutes. Spoon the lentils out into a wide serving bowl. Slice the sausage thickly on an angle, and arrange on top. Garnish with parsley sprigs, and serve. If you like, you can serve a bowl of salsa verde on the side. Oh, and the cotechino cooking water makes an excellent broth for soup. Z, A grand effort that will be rewarded, I promise.